Enter the South American jungle and experience the history of the Aztecs through the legendary warrior and emperor, Montezuma. Surrounded by nature and ancient civilisation, you’ll quickly immerse yourself in the life of the Aztec people. Powered by WMS Gaming, this 5-reel slot has 30 pay-lines on offer. 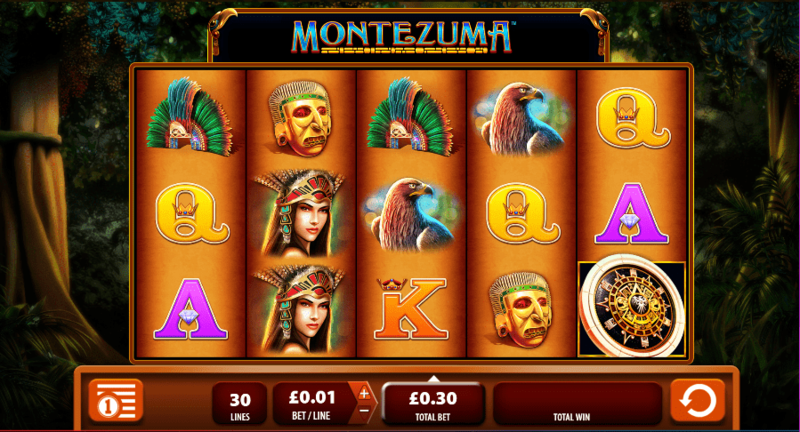 Montezuma thrives in two ways, the thrilling base game and great in-game features, such as Wilds and Free Spins Feature combined with a Multiplier Bonus. Deposit today and make your own history by collecting some fantastic cash prizes on WS. Play our new slot games here now! Based in the South American jungle, Montezuma is a warrior and emperor of the Aztec people who roam the jungle eliminating any threats. Set against a mysterious but pleasant jungle backdrop, this WMS Gaming creation is one of their best. Experience the abundance of the jungle as you play one of the best UK slots! The 5x3 clay-like gameboard has 30 active pay-lines with a mix of standard and Aztec-themed symbols. The lowest in value are the playing card icons ranging from jack to ace. 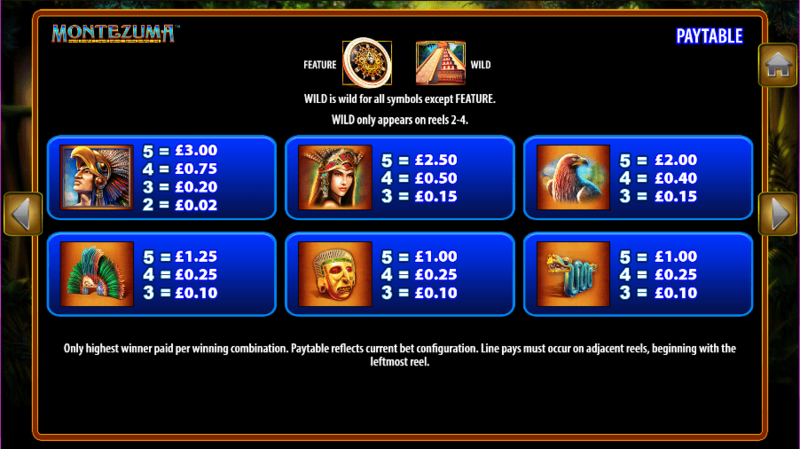 For medium value winning combinations, you’ll need to discover the snake statue, gold mask, feather cap and eagle. As for the highest base game wins, you’ll need to connect with the Aztec Princess and Aztec Warrior. FREE SPINS FEATURE – Hit 3 or more Shield SCATTERS to trigger the Free Spins Feature. Once you’ve entered the Free Spins Feature, you’ll be presented with a wheel that will determine how many free spins and re-trigger spins you’ll be awarded. E.g. 3, 5, 6, 7, 8, 9, 10, 15 or 25. At the start of each spin, another wheel will spin above the reels to determine the multiplier attached to that spin (2x, 3x, 5x or 10x). If you hit 2 or more SCATTERS during the feature, you’ll be awarded additional free spins which will be added to the number of free spins remaining. BONUS GUARANTEE – A great addition to the feature is the Bonus Guarantee. Any feature that ends with less than a 10x multiplier will automatically be increased to a 10x total stake multiplier. You’ll also receive a maximum limit of 300 coins for the initiating SCATTER pay-out.